NEW IN TOWN. The recumbent trike!! Recumbent bikes are DIFFERENT. They ride differently, they steer differently, starting and stopping is different, and climbing hills requires a slightly different approach. By and large they are quite fun to ride. Medical benefits of Recumbent Bicycles is what drew me to them. I have fibromyalgia and a couple other health issues that made it hard for me to ride a traditional upright bicycle. After doing some studying on the recumbents I decided to try riding for my health instead of taking additional medication. 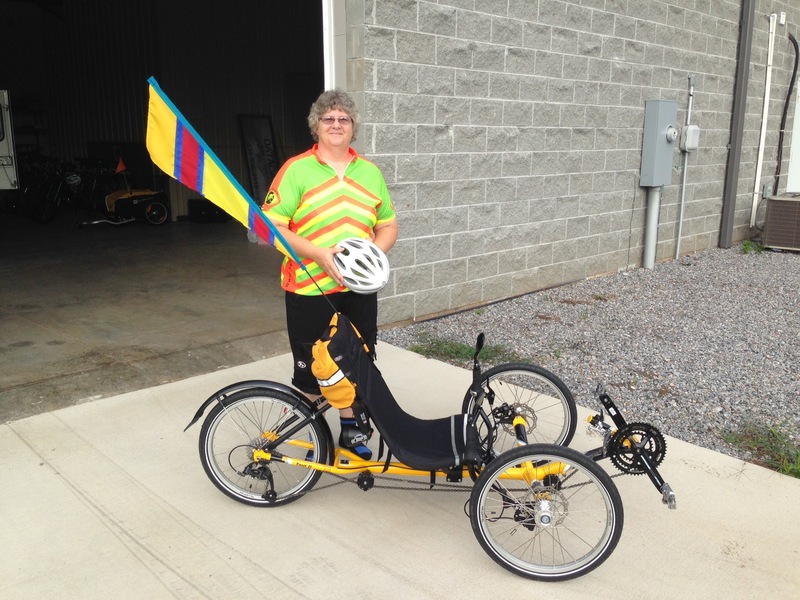 One lady reported Thirteen weeks after she had a hip replacement, she was able to ride a recumbent. Recumbents are often a way whereby people with repetitive stress injuries to the wrist, neck, or back can continue to ride bikes. Quite often such injuries make it impossible to bear any weight on ones hands, as is necessary when leaning on the handlebars. Injuries to the back or neck can also keep people off a regular bike, but seldom present a problem for recumbent bikes. The semi-reclined position of the recumbent rider provided a much broader distribution of the body weight across the more anatomically correct padded areas of the buttocks and across the back. The hands, arms and shoulders remain in a relaxed position not bearing the weight of the torso. With the back in a reclined positioned, the abdomen was flat and straight which allowed full and easy expansion of the lungs. The feet rested on the pedals allowing easy flexion and extension of the legs and afford a relaxed resting position much like on a recliner foot rest. The head is held in a neutral position, looking forward, the neck relaxed. The pains in the neck, shoulders and arms from day long rides disappear. Allowing longer, more enjoyable rides. Although recumbent bikes provide better positioning and comfort, you can still get a great workout riding one of these. Whether your seeking fitness, recreational riding or travel the ride will be rewarding. Recumbents draw crowds and conversations just about anywhere you stop. People notice recumbents and they want to know more about them. That’s why I decided to right this article to share in what I have learned and experienced. Victoria has a wonderful start on the rails to trails and great riding in the park. Street and country road riding is very relaxing and beautiful scenery all around. Get out and enjoy while getting the health benefits also.